When we think of Angkor Wat we picture those stunningly beautiful shots of the temple silhouette at sunset or with its striking reflection. It is synonymous with power, ancient wonder, and most importantly, beauty. To tell you the truth, I was nervous to go to the Temples of Angkor, my second UNESCO World Heritage Site. As a photographer, I felt a lot of pressure to get pictures just as beautiful or maybe more so then the ones I had seen in National Geographic or Lonely Planet. Of course, this pressure was completely self induced and completely ridiculous, but I was so eager to get that perfect picture that I caused a little anxiety to build up as I rode that 7 km road up to the temple from Siem Reap. I had attended a couchsurfing get together the night before and had invited a guy from Washington D.C. to accompany me, so we got an early start at 7:15, bicycle pedals ready and anticipation growing. 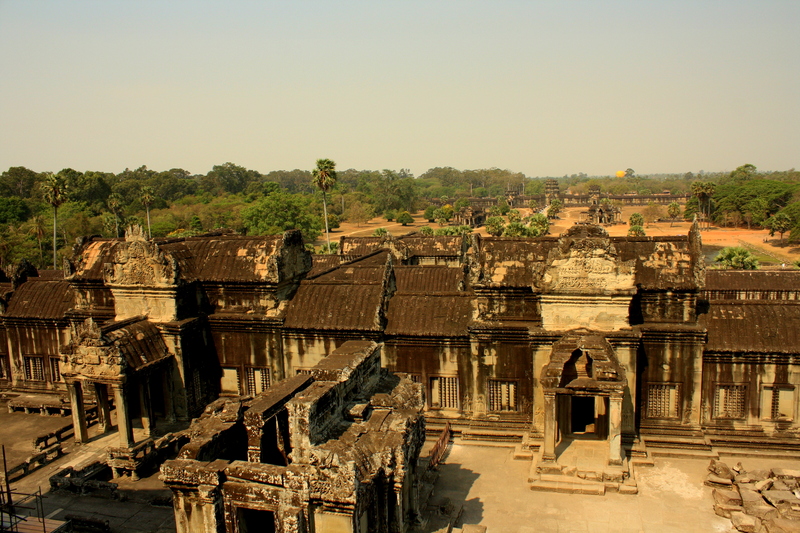 We purchased the 3-day pass and decided to head to Angkor Wat first. Angkor Wat was built in the first half of the 12th century and is the world’s largest religious monument. The temple is a depiction of the Hindu universe. The moat around the complex represents the mythical oceans that surround the Earth, the concentric galleries represent the mountain ranges that surround Mount Meru, the home of the gods, and the towers represent the mountain’s peaks. Approaching the temple, we had to brace ourselves for the hordes of tourists, cameras in hand, and touts trying to sell us everything from t-shirts to rip-off Lonely Planet guides. We entered through the gate and the world of Angkor Wat unfolded in front of us. We explored the spectacular bas reliefs and stone carvings around every turn. Dancing apsaras surrounded us with their sly smiles and graceful features. We climbed the steep steps of the main tower and took in the beautiful complex from above. I tried to imagine the hustle and bustle temple when it was a city inhabited by thousands of people. Too bad they didn’t have cameras back then! Unfortunately, they are working on restoring the monument and decided that bright green tarps were the way to go, so I wasn’t able to capture that perfect shot of the towers, but I do understand that renovation is necessary to ensure that generations to come will be able to appreciate the historic temple. 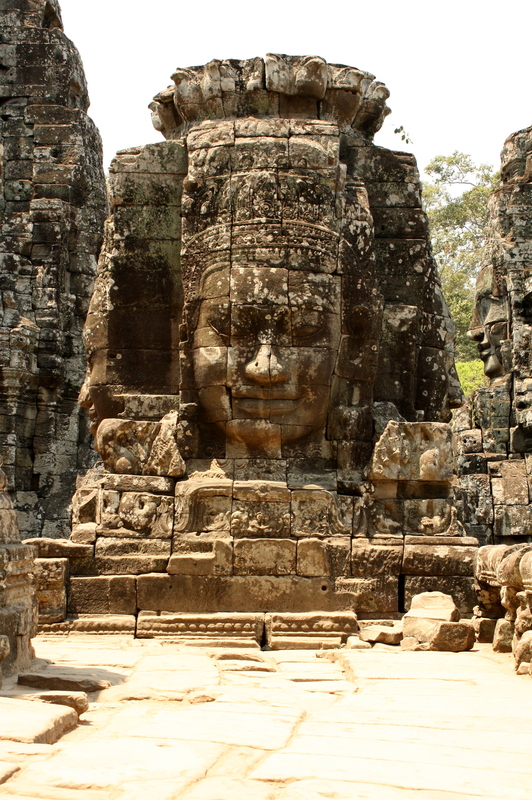 Next up was the ancient city of Angkor Thom, one of the largest Khmer cities ever built. We entered through the South gate and witnessed the peaceful faces of Avalokiteshvara, the Bodhisattva of Compassion, that ran rampant around the complex. The entrance to the gate is powerfully lined with statues of 54 gods (on the left) and 54 demons (on the right). We took our time throughout the day to explore the other four gates and found the East Gate to be one of the best experiences of our days at the temples. There were absolutely no other people there, we were able to climb up to the top of the gate and I was able to give one of the massive faces a little smooch. 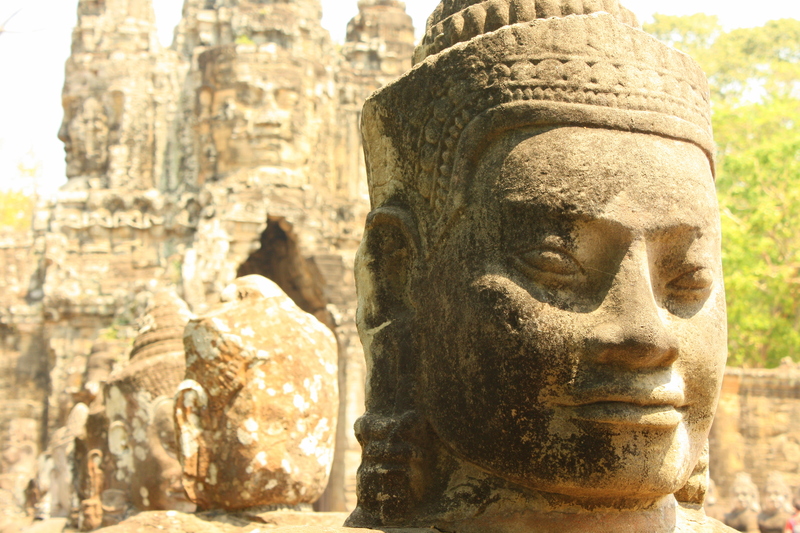 The Bayon is the main temple in Angkor Thom and it was one of the most spectacular of the Temples of Angkor. Having 54 towers, each donned with four mysteriously smiling faces, the temple has moved through many different religious phases from Pantheon of the Gods, Hindu worship and Buddhism. It gave me a sense that I was being watched at every turn, and as creepy as that may sound, I think it was with more of a protective air. I tried to explore every inch of the temple, getting lost in the narrow hallways and corridors, studying the intricate stone carvings and elegant dancing apsaras and climbing the crumbling stairs to the top. I couldn’t get enough of the faces that surrounded me and I never wanted to leave! But of course, there was much more of Angkor Thom to explore so I needed to pry myself away from the countless photographic opportunities. 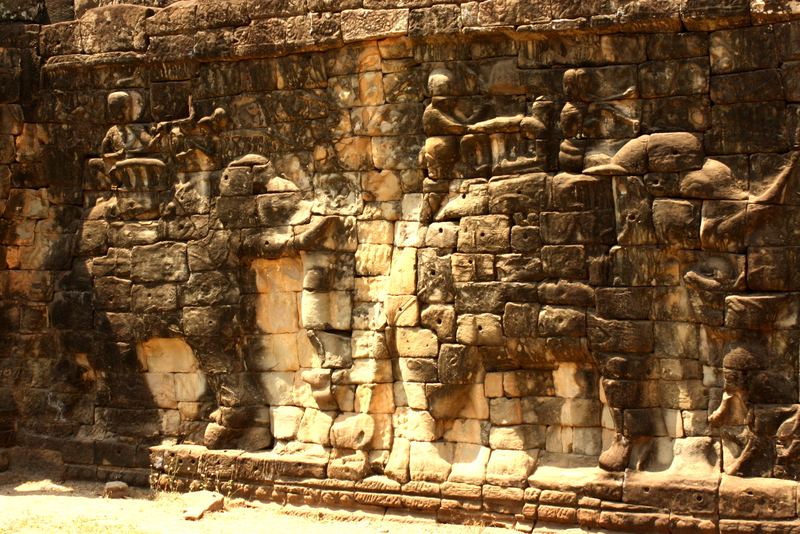 We meandered down the Terrace of Elephants, which is a 350 meter –long intricately carved stone once used as a viewing stand for public ceremonies and then moved to the Terrace of the Leper King, which donned beautiful carvings as well. We biked over to Baphuon next. 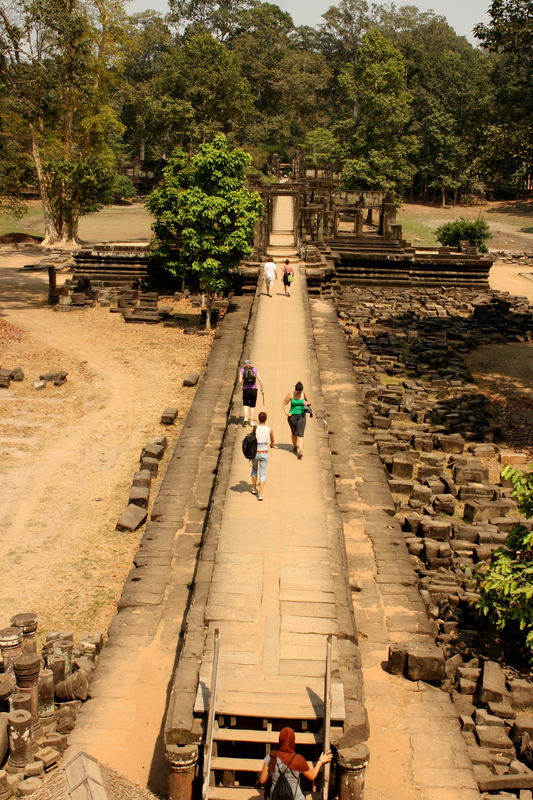 Baphuon is one of the oldest Temples of Angkor, being built in the middle of the 11th century (1060). The temple had began a massive restoration, being taken apart piece by piece, when the Cambodian civil war erupted and unfortunately all the records were destroyed by the Khmer Rouge, leaving a giant hopefully solvable jigsaw puzzle. Restoration began again in 1995 and was pinned to be done by 2002, but what we saw was definitely a temple deeply under construction with no sign of an end. I would love to come back here later and see the finished product! Sunset was approaching and we wanted to take it in from the “sunset hotspot” Phnom Bakheng, which ended up being a horrible idea. Because the temple is well known for its beautiful vistas and views of the surrounding countryside and temples (thank you Lonely Planet), we found ourselves surrounded by the most people we had seen all day. We had a leisurely hike up to the top dodging slow moving tourists and when we made it to the temple, we could barely see the stones through the massive amounts of people awaiting the sunset. The steps were extremely steep and I was thoroughly impressed with some of the elderly visitors that were able to make it to the top. We only hung out for a half an hour or so and then decided that it would be better to beat the crowds down. I can’t imagine what it would have been like making our way down those steps with hundreds of others trying to do the same. It was an absolutely amazing first day at the temples and I would definitely recommend not trying to do it all in one day. We were able to take our time and not feel rushed at all and we still have so many more temples to see in the next few days! Stay tuned for my next post! The picture of the sunset is amazing. Since I’m headed there in a few months, it’s great to hear which places in particular are magnificent. 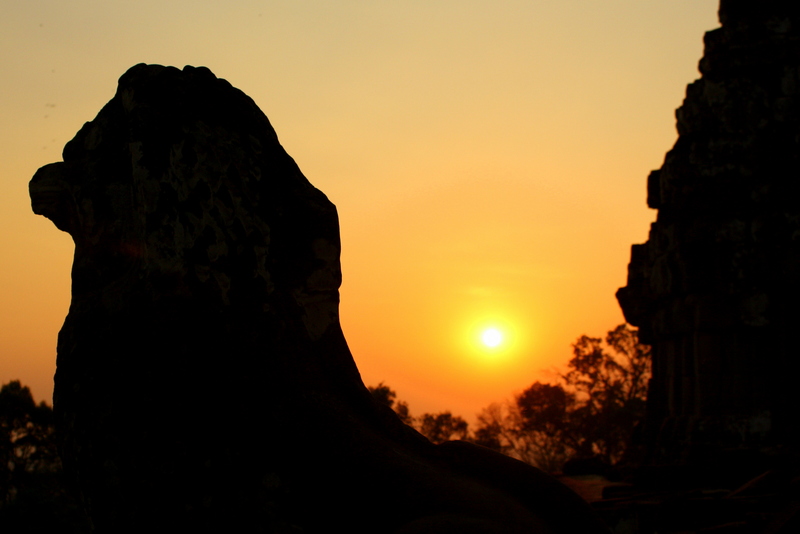 Have you been to Preah Vihear temple? I have! You can expect a blog post about it soon complete with pictures! Have you been to Beng Melea? This was the best temple better than Angkor Wat for us! It’s absolutely AMAZING!